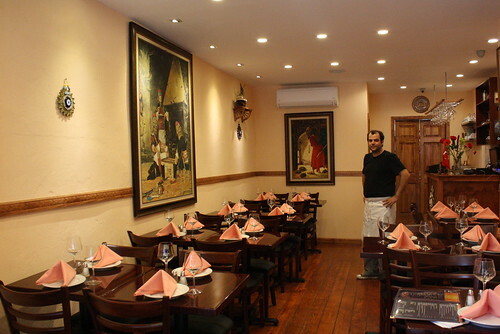 Melvin Felix Chef and owner Levent Akyol at Reyna Turkish Restaurant and Mediterranean Grill. Reyna Turkish Restaurant and Mediterranean Grill opened in the former Mission Cafe space on Second Avenue over the weekend. Owner and chef Levent Akyol, a veteran of many a Mediterranean kitchen, plans to concentrate on the food of western Turkey, which he said was more Greek influenced and seafood-heavy than its eastern counterpart. Mr. Akyol has been in the restaurant business since he was 10 years old. Back then, he cooked fish in his family’s restaurant in the city of Izmir, one of Turkey’s primary port cities. He moved to the United States in 1999 and was the owner of Marmaris Restaurant in Sheepshead Bay, Brooklyn, until it closed in February. Here, he’ll serve a similar menu: seafood casseroles, char-grilled fishes, meat kebabs, cold appetizers such as cod caviar salad and hot appetizers such as cheese rolls and stuffed mushrooms. True to Reyna’s name (it means “new again”), there will also be new dishes like Turkish chicken wings. Check out the new restaurant’s menu below. It’s B.Y.O.B. while it awaits a license to sell wine and beer, and will begin delivery soon. Next post Street Scenes | A Dunkin'vestigation?